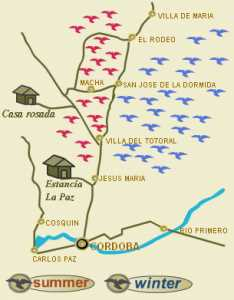 If you are considering dove hunting in Argentina, you will be happy to know that dove hunting season is all year round!. This is not the case in most places around the world where dove hunting is possible, but due several reasons Cordoba, Argentina, is probably the best location as there are plenty of doves all year round. Doves are a plague in the Cordoba fields and while their behaviour might vary across the year, our specialist dove hunting outfitters know where the best shooting spots are. Depending upon the time of year and the type of shots which your party wants, the dove hunting areas can be anything from beautiful green hills where the birds roost to agricultural fields such as sorghum or sunflowers where they fill up on these high-quality food sources to flyways in-between. 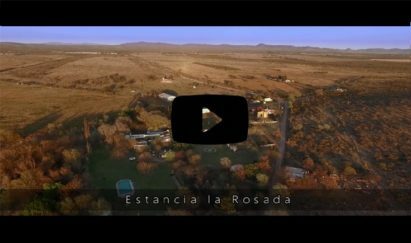 In summer days best fields for wingshooting will be to the west of San Jose de La Dormida, and during winter days we will take you to the fields located to the east of this city. You will be spending many hours outdoors every day, and while summer, spring, autumn and winter are different, weather conditions are always enjoyable in the Cordoba fields. Rest assured that you will find plenty of birds all year round. As you can see, we offer dove hunting packages split in 3 seasons, however this is due the variation of demand across the year, not the dove hunting conditions so come and hunt with us when is best for you and your group.